If you're one of the many people who dread nothing more than speaking in public, there's one thing you should know: The best public speakers may look like they're talking off the cuff, but preparation and rehearsal are the secrets to their success. 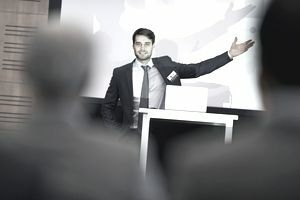 The secret to being comfortable giving a speech is to be prepared and confident in the information you are going to present and the words you will use to present it. When you're prepared and confident, you'll interject more of your real personality and feel free to be entertaining and relaxed. Knowing how to prepare will help you put your best foot forward. The first step is to consider the type of speech or presentation you will be giving—a few "impromptu" remarks, a short speech, or a keynote address. Write your speech down in advance, but don't try to read it word for word. Outline it. Stand up and practice it out loud, referring only to your outline if necessary. Refine your outline and practice it again. The outline for a speech of three to five minutes should fit on an index card. Divide your outline into three distinct parts. These are the messages you want to get across. As you rehearse, focus on getting those three points across. Keep rehearsing until you no longer need to glance at that index card. You can carry it on stage with you, but consider it your security blanket. A longer speech takes longer preparation. Start with an outline, expand it into a draft, and then refine that into a speech. A keynote speech can take a week or two weeks to draft, edit, and finalize. Organization and outlining can save you endless rewrites. Remember, this isn't about you. Your speech is about the people in your audience and their need for the information you have to deliver. You need to get it across to them in a way that will keep their attention, ensuring that they will walk out the door informed and impressed by your message. Try to grab your audience and keep them focused on your message. Speeches are seen, not heard. People "listen" to speeches with their eyes. In the first five seconds, with the sound off, you can predict how an audience will like a speaker. They've studied this with professors, job interviewees, and political candidates. You've got five seconds to convince an audience you're worth listening to. It's not about beauty. It's about the confidence, energy, and enthusiasm you project. Keep it moving. Your audience is going to be stuck in their chairs for 30 minutes or more, and some of them won't want to be there. Don't bore them into a stupor with too much detail. Keep your speech moving with a series of brief, easily digestible points that they can follow. To create a lasting impression, incorporate humor into your next speech.